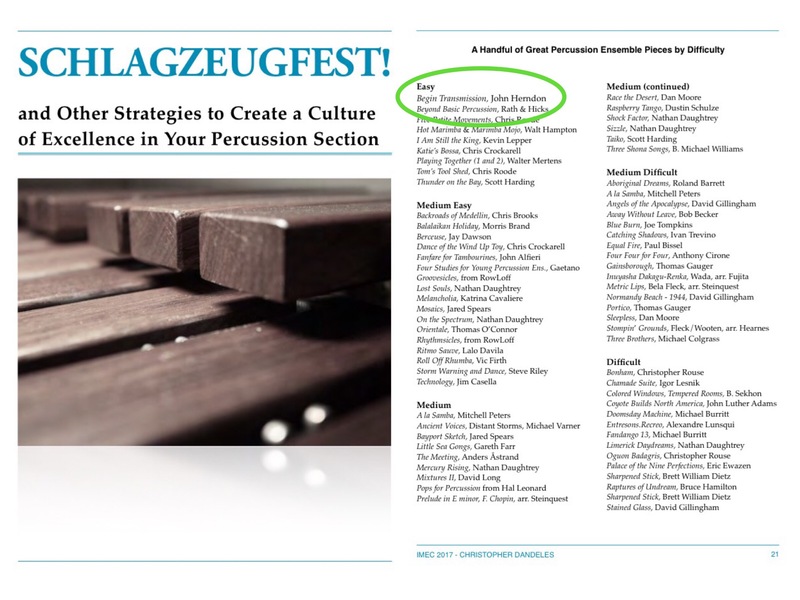 Mr. Dandeles presented at the Illinois Music Education Conference in January, 2017. The repertoire for beginning students is thankfully expanding, and Begin Transmission by John Herndon is a fantastic addition for providing students an opportunity to apply skills learned in the first year of percussion study into an accessible and lively piece. Although written for 13 players, Herndon provides the performing ensemble with options to omit parts for smaller ensembles of eight players. Begin Transmission takes a fairly simple theme derived from the first five notes of the D-minor scale and manipulates the timbres and textures around it to create a very fun and engaging ensemble work lasting just over two minutes. It is the perfect piece for a young ensemble, using only eighth-note rhythms and larger—with the exception of the snare drum’s use of sixteenth notes at the end of the piece. Another great feature of the work is Herndon’s use of timbral changes for the percussion parts, where players are asked to either switch instruments or play on the rim instead of the head. The mallet parts are simple and repetitive yet entertaining, providing a great experience for players and audience members. The accompanying players often lay a groundwork of steady eighth notes under the melody, providing the piece with constant forward momentum from beginning to end. Herndon successfully wrote an exciting piece for students to apply newly learned skills.